“Gumm” is going to be the first Pakistani release of 2019. With just few days left in the release of film, its promotional campaign has finally started yesterday with a press conference held in Lahore press club by the makers and distributors of the film. It was also announced that PTV network along with Capital TV network have been taken on board as media partners while leading music channels 8XM and Jalwa will serve as film’s official music channel partners. Directed by the husband wife duo Ammar Lasani and Kanza Zia, the film stars Sami Khan, Shamoon Abbasi, Shameen Khan, and Anjum Habibi in lead roles. Produced under the banner of Starstruck Films, “Gumm” will be distributed in Pakistan by “Distribution Club”. Film has been making rounds at various international film festivals and has already won 7 awards in more than 15 nominations and 8 official selections around the world. 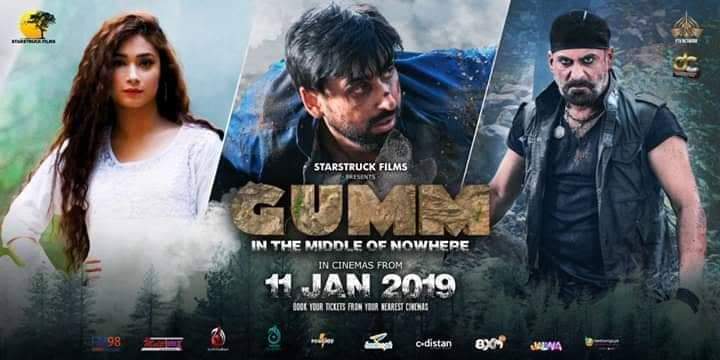 “Gumm” releases in cinemas on 11th January, 2019.